Gastrojejunostomy is a surgical procedure in which an anastomosis is created between the stomach and the proximal loop of the jejunum. This is usually done either for the purpose of draining the contents of the stomach or to provide a bypass for the gastric contents. I am Sivakumar N hailing from Chennai, Tamil Nadu. I am 33 years old and was diagnosed with Acute Chronic Pancreatitis which is now escalated to Pancreatic Cancer. The cause for this situation was due to some heredity conditions and my bad habits. I have been repenting ever since and have been clean for around 3 years now. All I want now is to become better and lead a good life. I used to work in an MNC with a good pay, but had to quit my job due to getting admitted in hospitals all the time, and now all the money I had saved has been exhausted in medical bills. In the recent years I have had multiple tragedies at my home, due to which I don't have a family support. I am surviving day to day with drips with whatever funds my friends can arrange. My current situation is really bad and it’s a struggle to get through each day, and I don’t know how much longer I can hang on. I have severe abdominal pain all the time, I am unable to eat solid food as I throw up immediately, I tried liquid food but sometimes I throw up or it just goes as diarrhea. I have lost all my weight and have very little energy. I am currently sustaining by taking drips from hospitals every few days. 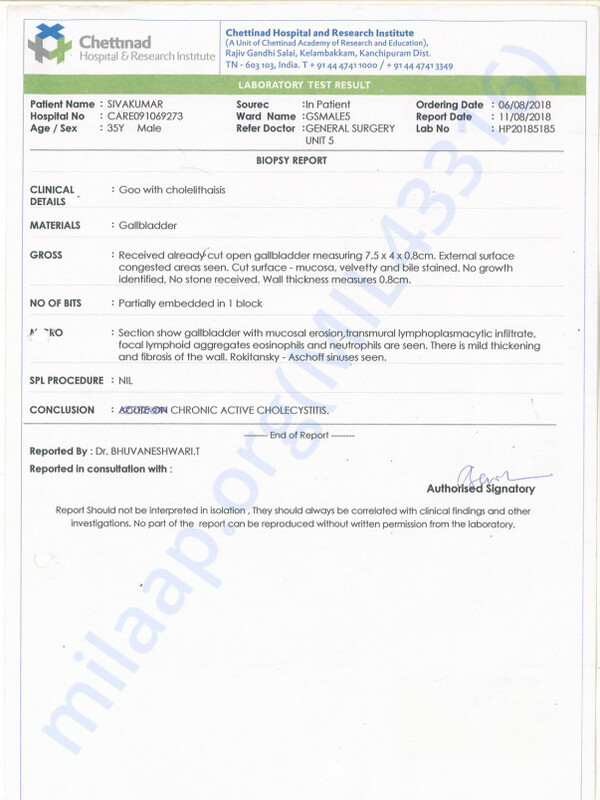 I underwent Holopathy Treatment at several Hospitals over the last 3 year and also holistic methods of cancer treatment recently in Madurai but my situation hasn't improved. With help of a few friends, I managed to get funds to do series of blood tests,Scans and endoscopy last week .I have all the test reports available. 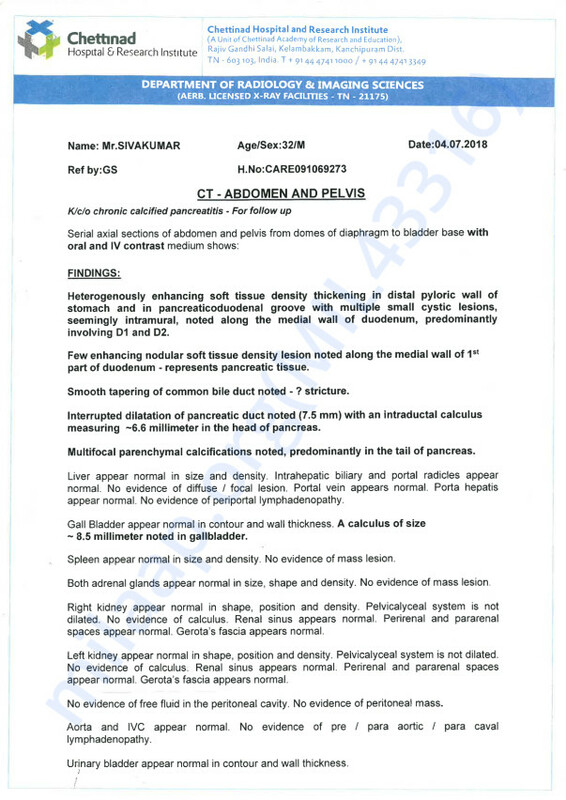 I have taken endoscopy in which there were findings consistent with deformed part of duodenum and food statis in stomach. 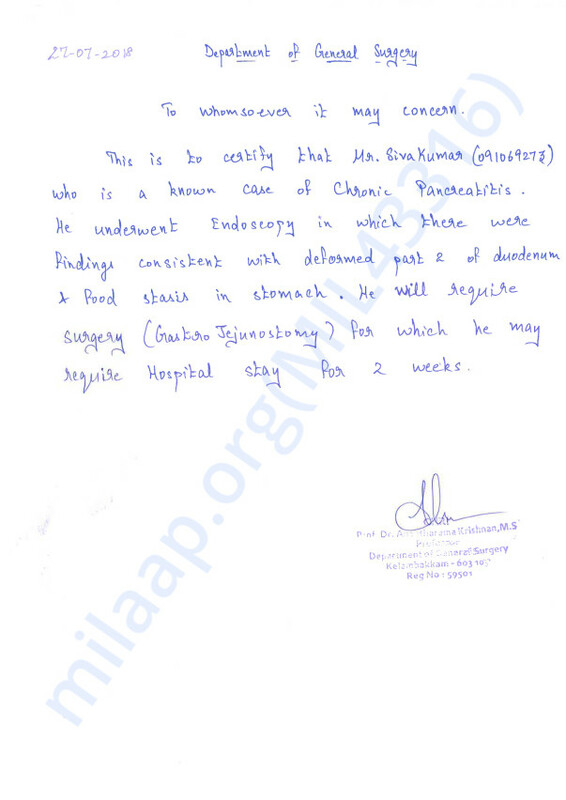 I need to undergo Gastro jejunostomy Surgery as per doctor advice in chettinand hospital, Chennai. Once I able to do this surgery, I can able to take foods and I can able to avoid vomit and diarrhea. Then I will regain my stamina and weight and able to join job again quickly. Thanks to the Milaap contributions, I was able to start with a treatment program to help with my condition. However, to complete it I still need more financial support. My only wish now is to get better so that I can start working again and land back on my own feet, and lead a good clean life. I cannot begin to express how grateful I am to the contributions so far, and this is what has kept me going. I am really in need of urgent support to complete my treatment, and any amount at this point would help me a lot. So request you to please support me. Once again, I would like to thank each and every one of you for your valuable donations. The last few weeks, I have been overwhelmed by the support that I have got from friends and strangers. I am truly grateful to all of you. There were a couple of times in the last few months where my treatment was halted, or medical tests delayed because of lack of funds. But due to all your help, it has all moved forward and I am happy to say that I have completed my two major surgery ( Gastrojejunostomy with cholecystectomy ) and discharged. It was only a few months back when I was in a situation without any hope or support. But now, thanks to all of you, I have found support from so many places. Its still a long journey for me towards improvement, but I have a lot more hope & confidence now. Within a few months I able to regain weight and stamina and join job again. Now able to take foods without vomit and diarrhoea. 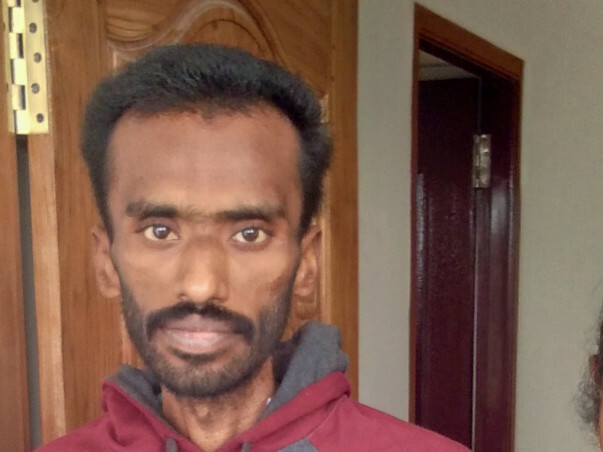 I have promised myself that once I get better, I will get a job, and I will donate regularly in Milaap and to other people who are in need like I am right now. I would like to thank you for your support towards my treatment. All your help is the only reason that I have been able to make it this far, and I don't have words to describe how grateful I am. I can never forget this help. Also, humbly requesting you to please share my milaap post to your friends and family groups to get the word out. All my help so far has been from strangers to my friends, and I am hopeful that spreading the word will help me some more. Thank for being so supportive further I wanted to share a update.My Sincere aplologies for not been able share any more updates since last Saturday. A BIG THANK to ALL. To all of you who supported me when we needed it the most, by means of your Prayers and financially. GAstrojunostomy with cholecysteeetomy ) and discharged Saturday. Thank you for the great support firstly with prayers and with contribution , its only me who can feel it . I am 100% confident and very strong now , I need definitely prayers and other funds. Am going to have a discussion with my Doctor tomorrow and plan it accordingly and will update you . Please share and continue contribute, your little contribution can help my complete treatment and recovery during this difficult time. 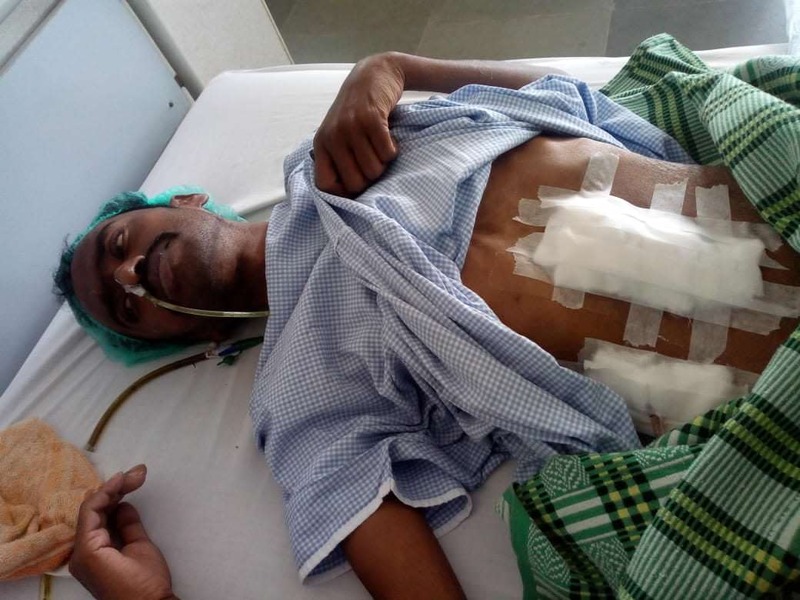 On August 6th, I have undergo below surgery in chettinand hospital, kelamabakkam Chennai. 3. Gall bladder stone sent to research lab to confirm cancer severity. Last Few days in ICU and now shifted to normal ward. Need to hospitalized for further 15 days. Still body full of wires and not fluids taken yet. Still glucose and medicine passed through vain. Thanks a lot for all your kind help so far. Please kindly help me soon and I need of more funds yet. I will keep on updating the treatment status and also medical bills. Thanks a lot once again from my bottom of my heart for all your kind support.